Names carry significance. Although I have written about Kosherica in the past, each time attempting to highlight another aspect of their exemplary programming, I have not yet analyzed the name of this company, which I think tells a significant story in and of itself. Interestingly, there is another discovery attributed to Archimedes that has to do with cruise ships. King Hiero commissioned him to a construct a ship that was initially called Syracusia, but since it was too large for any of the Italian seas, it was given as a gift to Ptolemy the King of Egypt and renamed the Alexandria. Without downplaying the great genius of Archimedes, he has surely been outdone by the people at Kosherica. It’s one thing to figure out how to put a cruise ship that large on the waters and it’s quite another altogether to have to wine and dine a clientele with refined tastes, for ten days, and at times even up to two weeks and to receive rave reviews time in and time out. No matter how good a service provider one is, there are always differing opinions. It is normal to garner critical reviews and they should not necessarily detract from the overall great reputation of that business. However, I have yet to meet anyone who tells me they traveled with Kosherica and they were not completely taken by the food service, courteousness of the staff, and the painstaking attention to every minute detail that goes into planning these things. An invention that is really deserving of screaming eureka (although I’m not sure how well the streaking through the streets would be received these days), is the ability to provide these five star accommodations and unprecedented food service at an affordable price. I am specifically highlighting the yeshiva week budget cruise aboard Royal Caribbean’s Allure of the Seas leaving from Miami on Sunday, January 20, with ports of call in Nassau, Bahamas, Cozumel, Mexico, Roatan, Honduras, and Puerto Caya Costa, Mexico, before returning to Miami. If you’re the type of person who likes to know all the choices before making a decision, Kosherica offers many cruise options — one of which will surely meet your list of requirements. There is a cruise leaving from New York called the Canada/New England Cruise that lasts seven nights. 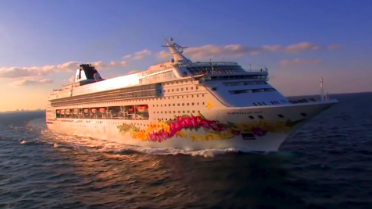 Another cruise leaving from New York is the Bahamas Cruise, leaving December 21 for seven nights. There is the all famous Jewish Music Festival at Sea travelling on Royal Caribbean’s Allure of the Seas, leaving January 13, that could only be described as the chazzanus and Jewish music lovers’ heaven. Lastly there is the Asia Cruise leaving January 2 aboard Holland America for 15 nights. If you’re thinking it would be easier to leave from New York, that is an option, but the boarding process in Florida is so seamless and convenient it should not even factor into your decision. There are shuttles to and from the port and airport with plenty of time to get there the day of the cruise, especially if you are leaving a young family at home and don’t have the luxury of spending another few days away to arrive the day before the cruise and depart the day after. A little about the Allure of the Seas: Allure supplanted its sister Oasis of the Seas as the largest passenger ship in the world. Unlike Archimedes’ Alexandria, which was the largest cruise ship in its time at 110 meters, Allure of the Seas is a whopping 363 meters (1,187 feet). My wife and I were on Allure the last time we cruised in the winter, and I can tell you that the size of these ships is indescribable. There are bars, amphitheaters, ropes courses, and a casino among nearly 20 floors of rooms and activities for the entire family. But the truth is that at a certain point there’s enough describing, prodding, and selling and you just have to go experience it for yourself. So visit Kosherica online at kosherica.com or give one of their courteous customer service reps a call at 877-724-5567 or 305-695-2700 and give yourself and your spouse the vacation that you’ve always dreamed of and most certainly deserve. You’ll thank me that you did.